ProBEAM® Bullet Bezel 1157 Rear LED Turn Signals include ProBEAM® 1157 Red LED Turn Signal Inserts with choice of Chrome or Gloss Black ProBEAM® Bullet Bezel Turn Signal Adapters with built in DOT and SAE compliant red lens. Upgrade to Smoke Lens Bullet Bezels (Sold Separately) here: ProBEAM® Bullet Bezel Turn Signal Adapters. 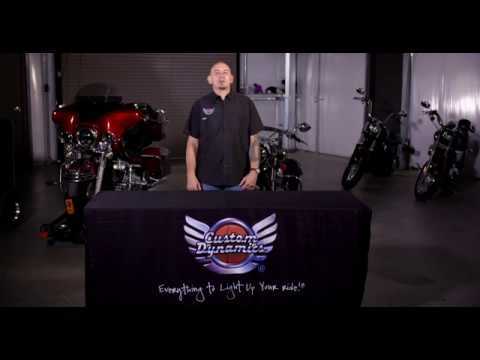 ProBEAM® Rear LED Turn Signals are NOT compatible with Custom Dynamics® LED TriBAR for 2010 - 2013 Street Glide®/Road Glide® Custom Models. Plug & Play rear turn signals on Harley-Davidson® models with 1157 dual contact bases (models without center taillight) and Bullet Style (pop-off) lens and 2009 - 2012 Street Bob. ProBEAM® Front LED Turn Signals and complete LED Turn Signal Kits also available.